Mercer Health and Community Sports and Therapy Center have partnered together to offer a “Healthy Waves Challenge” to motivate and encourage the community—YOU—to get up and MOVE. Participants are required to complete 1,020 minutes of moderate intensity aerobic activity for 6 weeks from May 14th to June 24th. Participants must be 18 years old. Entry forms for the “Healthy Waves Challenge” will be available at Mercer Health Registration Desk, Mercer Health Weight Management Center/West Campus, Community Sports & Therapy Center locations, Mercer County libraries, as well as area schools and fitness centers. Also visit the Mercer Health and Community Sports and Therapy Center websites and Facebook pages for entry forms. All completed forms will need to be submitted by July 1st to be entered in contest for prizes which include $100 gift certificate to area fitness center of your choice, $100 gift certificate for a pair of shoes, and $50 Mercer County Chamber Gift Certificate. 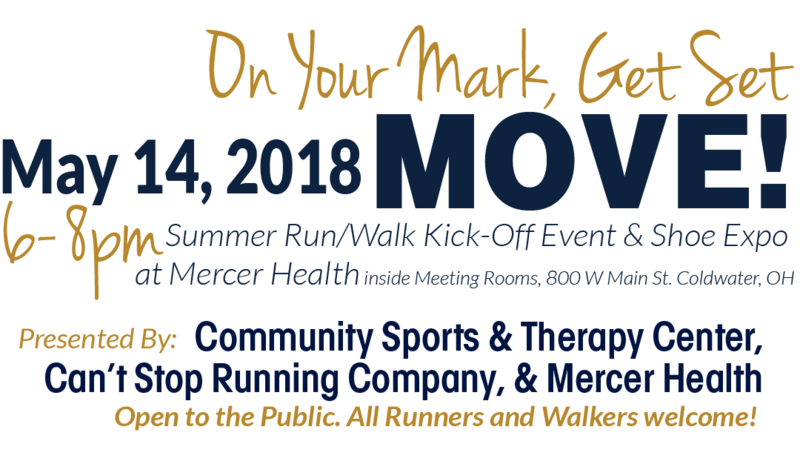 In conjunction with the “Healthy Waves Challenge” is a summer run/walk kick-off event and shoe expo, “On Your Mark, Get Set, MOVE!” This will be held at Mercer Health inside the meeting rooms at 800 W. Main Street, Coldwater, Ohio on May 14th from 6 to 8 pm. Event will include presence of physical therapy staff from Community Sports & Therapy Center for questions & screens for functional strength/stability; healthy eating tips from Mercer Health Nutrition Services; wellness tips, couch to 5K, & MedGem System information from Mercer Health Weight Management; free chair massages from The Revival Spa at the Galleria; and more! All completed forms for the “Healthy Waves Challenge” will need to be submitted by July 1st for a chance at a prize at various locations. Please contact Mandy Wendel at 419-678-5247 or mwendel@mercer-health.com or Stacy Schwieterman at 419-678-5150 or sschwieterman@cstcenter.com with any questions.